I’m not a coffee drinker. 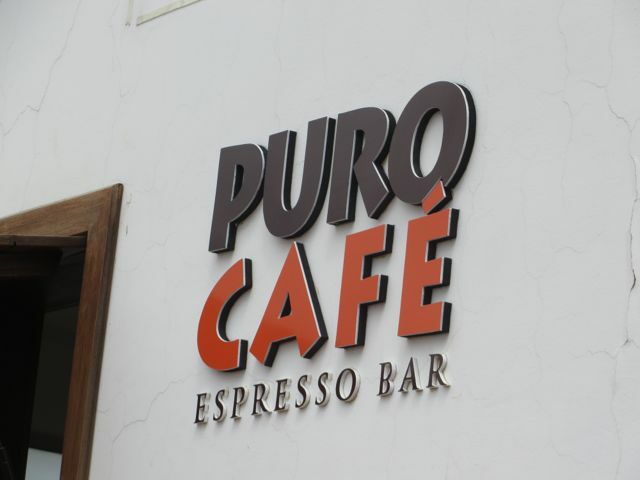 But I will purchase a cup of good coffee now and then – especially if it means I can sit at Puro Cafe, on the terrace of Iglesia Todo Santos, and watch the rain showers pass by. I discovered this place about a month ago, on my first big walk through town. The terrace at Todo Santos is one of the best views above of the river Tomebamba. 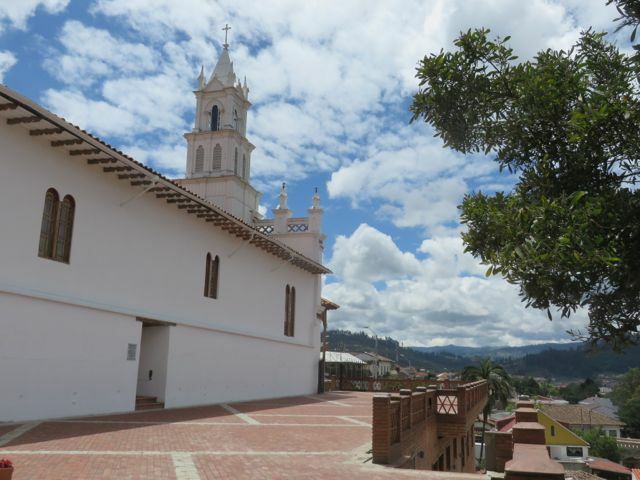 The Tomebamba divides the old, central part of Cuenca, which sits up on a hill, from the newer, modern part of Cuenca, sitting below, in a valley. The terrace affords a view of the whole valley, bounded by the Tomebamba on one side, and the Yanuncay on the other. There is a spectacular 180 degree view to the south, and an expansive view of the sky. I would sit here all day, if I could, just watching the clouds go by. I especially like this spot because it’s secluded from traffic and passers-by. It’s a great place to escape the diesel fumes and bustle of the city. 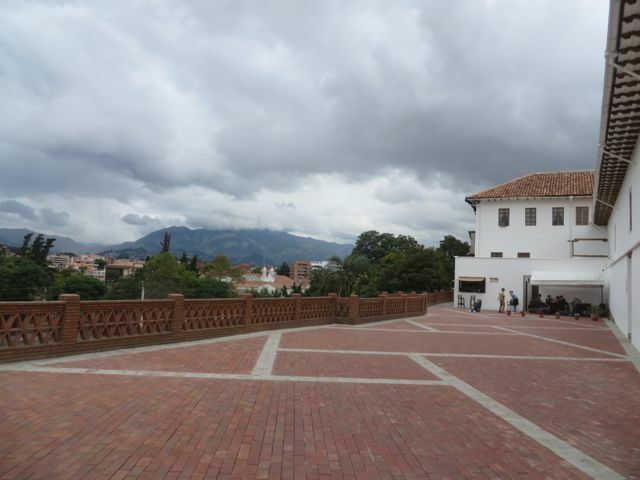 The terrace of Todo Santos, with Puro Cafe at the other end, and the mountains of Cajas National Park off in the distance (obscured by clouds). A glimpse as to why this place is great for cloud-watching. 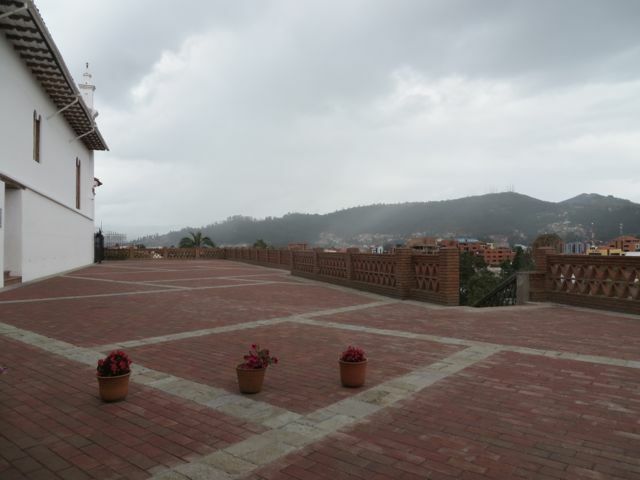 Showers pass from the northeast (on the other side of the church) to the southwest, across the valley as seen from this terrace. 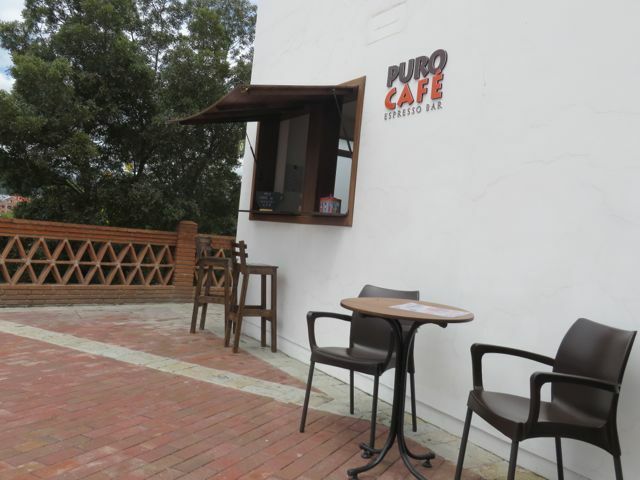 Puro Cafe has only been open for about three months. Run by a friendly lady from Belgium, the cafe offers high-quality coffees and hot chocolate, and a few snack items, including the occasional chocolate chip muffin or ‘zucchini cake’. Because I’m only an occasional coffee drinker, I always get the ‘Americano’ coffee – a straight-up cup o’ black coffee (ok, I add lots of sugar). 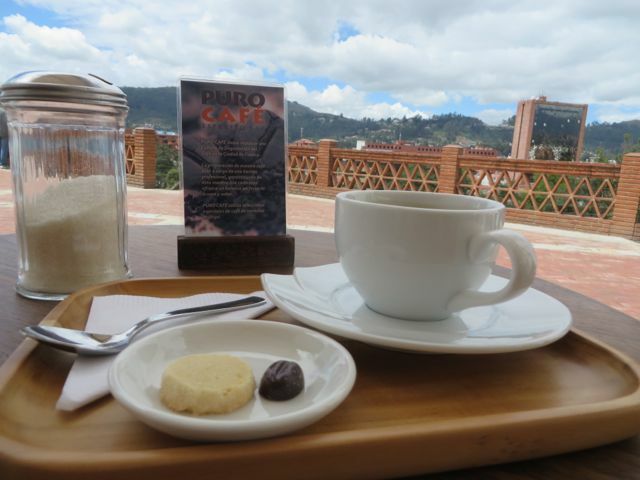 Most Ecuadorians drink their coffee with half a cup of hot milk. Definitely not my cup of tea (and if I could find a cafe with high-quality loose-leaf teas, I’d be there! But tea is not a ‘thing’ here, like it is back home. I would come back to Puro Cafe for the view, in any case). Aside from the rivers and parks, this is one of the most peaceful places in the city, and I’ll keep coming back here until it’s time to go home! ← El Niño is here! Looks like you’ve discovered a really beautiful spot. I’d go for the hot chocolate!! Bet it’s good. That looks lovely! I’d be there a lot too for the peace and quiet.